Recently I had the privilege of meeting a recent recipient of the Medal of Honor, our nation’s highest recognition for gallantry in times of war. Florent Groberg was born in France to a French Algerian mother and never knew his natural father. He was lucky in that a man named Groberg met and married his mother, adopted Flo and moved his family to the United States, giving them an existence that most in the world still envy. While looking for a speaker on veteran’s employment Flo’s name popped up on Linkedin at just the right time; he is working with Linkedin on veteran transition issues. In a very short time I was reminded about all that we owe our veterans in a powerful way by Flo. Flo told his life story to an audience of business professionals. It was highly personal. He shared his early memories of France, moving here and knowing no English. Experiencing the knowledge that one of his mother’s nephews killed himself in a terrorist attack. Experiencing 911 here in the US and being motivated to fight for his country. It was then, as he chose to join ROTC, that he learned that in order to get clearances he would have to renounce his French citizenship. And then he made that statement with which this piece is titled: “I wanted to earn the right to be an American.” The room I was in fell silent. He eye-balled us. In one simple sentence so many thoughts came rushing in. When do we hear this now? When are we reminded just how precious life in this part of the planet under our set of ideals is? We are subjected to an ongoing onslaught of grievance and very very little about our obligations, our responsibilities, our stewardship of this country. Flo said volumes in a very short sentence. I am keeping this about Flo so I will not follow all of the rabbit trails that the aforementioned grievance culture can dredge up. Flo threw himself on a suicide bomber in order to save the men he was working with and the VIP’s he was charged with protecting. Four of those men died; others were seriously injured, including Flo who spent three years convalescing. Flo’s messages were profound and inspiring. He spoke of resilience first and foremost. Knowing many had it worse than he did and many never came back, he still struggled with survivor’s guilt. A visit from Travis Mills, a quadruple amputee and war veteran finally snapped Flo out of his anger. He developed a new mission to help veterans make their transition from the military as effectively as possible. 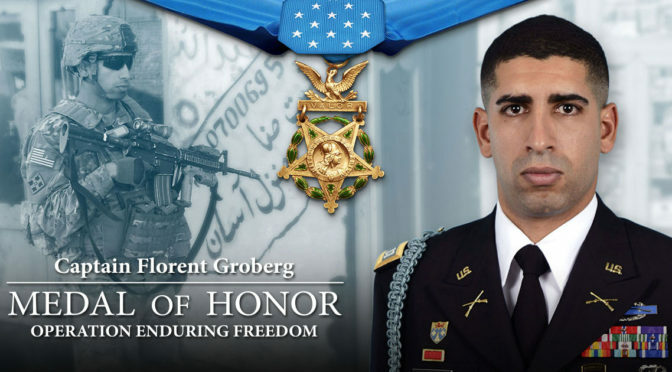 Florent Groberg is America at its best. An immigrant. Heroic. Funny. Responsible. Idealistic. Tough as nails. An Army Infantry Airborne Ranger. I am proud to know him even though he’s a cubs fan. Flo talked at length about needing to learn with humility from the senior enlisted men that reported to him. He talked about the application of these principles to civilian life and how humility is an essential part of leadership. He spoke of the unique attributes of veterans of the service and how they add value for employers. Message received, Flo, message received. This old veteran will do everything he can to continue to share it. Hooah! I hope I have the opportunity to buy Flo a beer some day and thank him for his patriotism!